Organic solar cells are flexible, transparent and lightweight, and can be manufactured in arbitrary shapes or colors. Thus, they are suitable for a variety of applications that cannot be realized with conventional silicon solar cells. 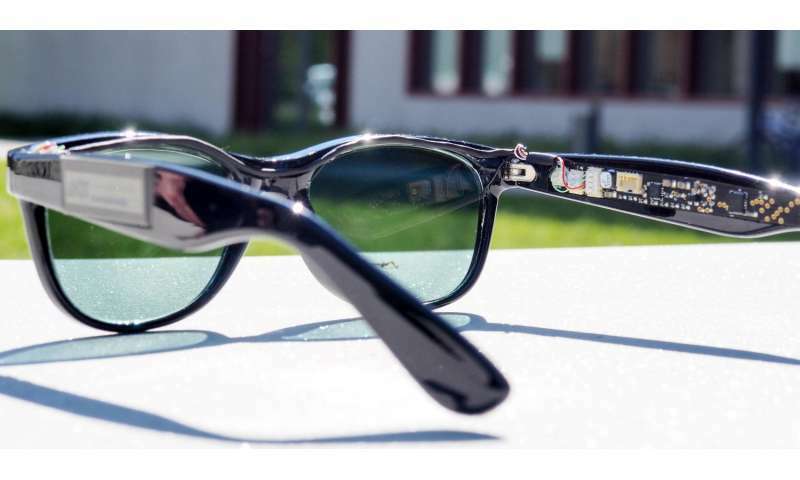 In Energy Technology, researchers from KIT report sunglasses with colored, semitransparent solar cells applied to the lenses that supply a microprocessor and two displays with electric power. This paves the way for other applications such as the integration of organic solar cells into windows or overhead glazing. "We bring solar power to places where other solar technologies fail," says Dr. Alexander Colsmann, head of the Organic Photovoltaics Group at KIT's Light Technology Institute (LTI). The "smart" solar glasses were designed as a case study by the scientist and his team at KIT. They are self-powered to measure and display solar illumination intensity and ambient temperature. The solar cell lenses, perfectly fitted to a commercial frame, have a thickness of approx. 1.6 millimeters and weigh about six grams, just like the lenses of traditional sunglasses. The microprocessor and the two small displays are integrated into the temples of the solar glasses. They show the illumination intensity and the ambient temperature as bar graphs. The solar glasses also work in indoor environments under illumination down to 500 Lux, which is the usual illumination of an office or a living area. Under these conditions, each of the "smart" lenses still generates 200 milliwatt of electric power—enough to operate devices such as a hearing aid or a step counter. "The solar glasses we developed are an example of how organic solar cells may be employed in applications that would not be feasible with conventional photovoltaics," says Ph.D. student Dominik Landerer, who largely contributed to the development of the solar glasses at the Material Research Center for Energy Systems of KIT. In the eyes of the engineer, these solar cells, which are based on hydrocarbons, offer mechanical flexibility. Their color, transparency, shape and size can be adapted for the desired application.